We’re here to talk to Amy about her goddaughter Dionne, a gorgeous , super-talented incredibly grounded and non-precocious 12 year old, whom Amy has known since she was a baby. The bond between the two, as they cuddle, walk arm in arm and gossip in each other’s ears secretively is truly heart warming; more teen girl best friends than pop sorcerer and apprentice. When Amy deals another deck of cards and gives Dionne a tarot reading, I overhear her telling her pal; ‘This one means you need to knuckle down with your rehearsing,’ and ‘this means you have to keep up with your studies.’ Dionne looks on, eyes saucer-wide, mouth open, nodding obediently and earnestly. It’s true what Amy’s friends have been telling me; she really is a sweet girl. Far from being a sad and haunted figure, tonight Amy is chipper, optimistic and feeling better, she reckons, than she has for a long time. Why now? With Amy all roads lead back to Blake, her long lost husband of barley 12 months , locked up on charges of serious assault and attempting to pervert the course of justice. Amy tells anyone who will listen that Blake will be out of prison and back in her arms. It’s this thought , this unwavering certainty, which is keeping her focused on the future, on the perfect, idyllic, roses around the front door life she believes the star crossed lovers were meant to share with each other. You scarcely dare suggest that his freedom is by no means guaranteed. And you’d be wasting your breath if you did. Her friends insist Amy is battling the drug problems that have scarred her recent life. The danger seems to be that in pinning all her hopes, and reasons to recover, on her husband’s swift return, what will become of her if Blake doesn’t emerge blinking into the sunlight the next week? Given the duo’s turbulent history, others could be forgiven for worrying even more for Amy’s well being should Blake win freedom. Dealing with the incessant media attention hardly makes her life any easier. The day after the interview, Amy’s friend tells me that as she was arriving back at her home, somebody jumped out and grabbed her bottom – forcing Amy to retaliate with fists of fury. Naturally the pictures of a snarling Amy were published in one of the next’s mornings tabloids with a headline implying she was some kind of wild animal. OK! : So tell us about Dionne..
OK! : A little boy? AMY: Yeah. I’m a little boy, ant I? (points to the white shorts and yellow polo shirt) Look at me, in me little run around? To be honest , I think kids have a lot more going on than adults. They’ve got their heads screwed on a lot better . Blake and I can’t wait to have kids. OK! : What’s been the happiest time of your life? AMY: I’m happiest with my family around me. When I see my dad smiling and laughing and all that. And when my Blake’s happy, that goes with when I’m happy. OK! : Do you like being famous? OK! : But obviously you are..
OK! : Is it crazy in your house? Have you got paps outside 24/7? AMY : It’s been alright recently. I’ve been in hospital. OK! : Was it emphysema as reported? AMY : No. It wasn’t. I did have some areas of emphysema, so maybe some of it was. OK! : How are you getting better? Are you eating properly? AMY : Eating loads of healthy food, sleeping loads, playing on my guitar, making music. And writing letter to my husband every day. OK! : If you could send a message to Blake right now what would it be? AMY : He knows. (looks down) He knows. OK! : Is it hard to know who to trust? AMY : (Nods her head) It’s sad. OK! : Does it make you unhappy? AMY : No. I’m alright. I’m a good judge of character. OK! : Dionne was telling us that she’s a good judge of characters too. Do you ask her what she thinks? AMY : Deffo. I’m like ‘Do we like this person?’ and she’s like : ‘ No way!’ (Smiles) She’s good. She’s good. OK! : Do you feel like she’s the grown up? AMY : Yeah! Deffo. She’s amazing. OK! : What advice would you give to a girl with a broken heart, listening to your music? AMY : You’ve got to know that you really love them. When me and Blake met we were best friends, and I knew he had a girlfriend. And he tried to hide it from me but I don’t think he realised that I wasn’t that bothered actually. To be in love with someone is to be able to let them go and do what they want. And pray they’ll come back to you. I didn’t know that we were in love. Everybody else knew apart from us. I didn’t know we were destined to be together I’d die without him. I thought I’d never see him again. But everybody else around us knew we’d be together. OK! : What do you most adore about him? AMY: He sees the good in everyone. The same as I do. OK! : Do you ever wish you weren’t famous, that you and him could just go away? AMY: There’s no point in thinking like that. I’m a realist and a dreamer. There are certain things you give certain people and certain things you can’t. OK! : You’re friends with Aisleyne and Kinga from Big Brother. We saw pictures of them at your home..
AMY: Yeah. I don’t know Kinga that well. I love Aisleyne, though. Do you have her number? She’s a lovely girl. I find a lot of girls put me down. OK! : What do you think about the comparisons between you and Britney? AMY : I think she’s been tormented. OK! : Do you feel tormented? AMY : I don’t have regrets. OK! : What’s your biggest hope? AMY : That I have kids. OK! : What’s animal would you be? 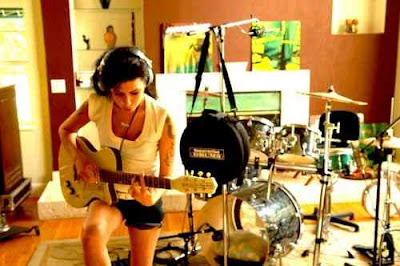 AMY : A lioness. Blake would be my lion. OK! : What’s your favourite TV? AMY : I like countdown. On my life, I would love to go on Countdown. OK! : Lastly, Amy, it was reported that you and Blake have an open relationship? AMY: Does that mean that we both see other people? No way. We are absolutely obsessed with each other. We both pinch ourselves daily. It’s unbelievable that the person you’re both obsessed with is the person who loves you the most in the world. OK! : Is that never too overpowering? OK! : Does that scare you? AMY: (She looks with a mixture of defiance and amusement) Yeah! Its great! OK! : Do you like danger , Amy? AMY: (Smiles) I love my husband.